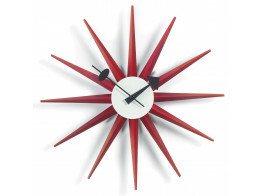 Sunburst Clocks, Red, in lacquered wood and metal; high-grade quartz clockwork includes battery. 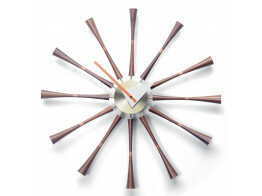 Spindle Wall Clock by George Nelson is an alternative to conventional timekeepers. 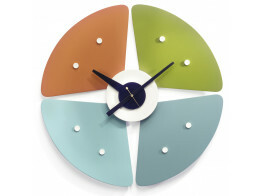 Petal Wall Clock was originally designed by George Nelson in 1960. 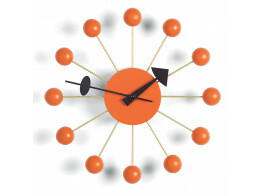 Designer contemporary wall mounted Ball Clock is constructed using lacquered wood and metal. 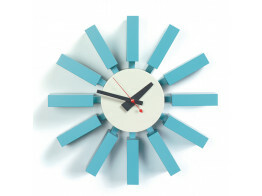 Block Wall Clock with an internal high-grade quartz clockwork mechanism. Battery included. 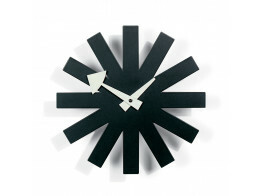 The Asterisk Clock was originally designed by George Nelson in 1950. 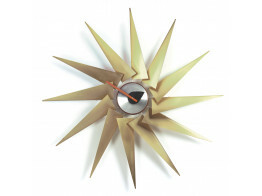 Star Clock is equipped with high-quality quartz movements; a refreshing alternative to conventional clocks. 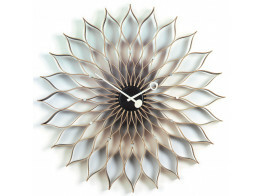 Sunflower Wall Clock was originally designed by George Nelson in 1968 and will shine in any room. Sculptural shapes of brass and aluminium combine to create the Turbine Wall Clock.